Information on Cretaceous plants and animals. In the beginning of Cretaceous period, the seas began to raise, and large areas in northern and central Australia became inundated. (That's when the Great Artesian Basin was formed in central Queensland). There was also a new chain of volcanoes, mainly andesitic, in north Queensland and Tasmania. Gondwana continent started to break up - India took off. The climate was still warm and humid (temperate) and there was plenty of rainforest which was the dinosaur habitat. 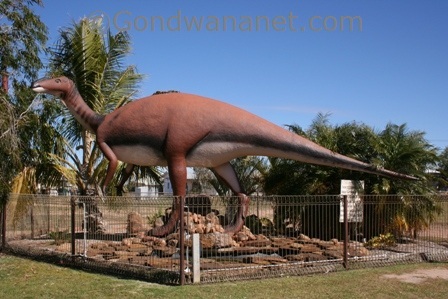 Most of dinosaur fossils found in Australia are from this period. 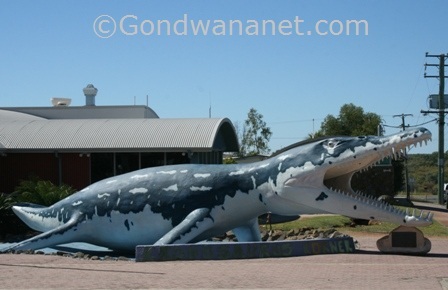 Central Queensland is a dinosaur hotspot with skeletons/tracks found around Winton (including Lark Quarry); Muttaburra (Muttaburrasaurus), Hughenden and Richmond (Kronosaurus). Other places where fossils have been found are in southern Victoria, and Broome in the Kimberley region in Western Australia. 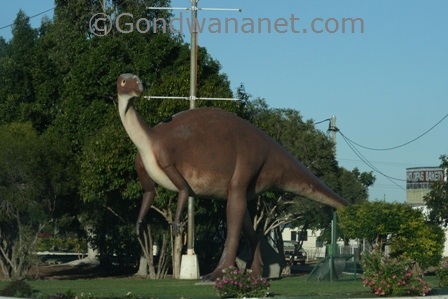 In most of those places there are dinosaur statues and often a museum that displays their fossils and skeletons. Other Cretaceous animals included fish, lungfish, shells, insects, ammonites, crocodiles, turtles, platypus, giant marine reptiles, and modern birds with feathers. Plants included cycads, ferns, mosses, kauri, hoop and Bunya Pines, and podocarps such as Huon Pines. What was new was that during this period, the first flowering plants (angiosperms) evolved.